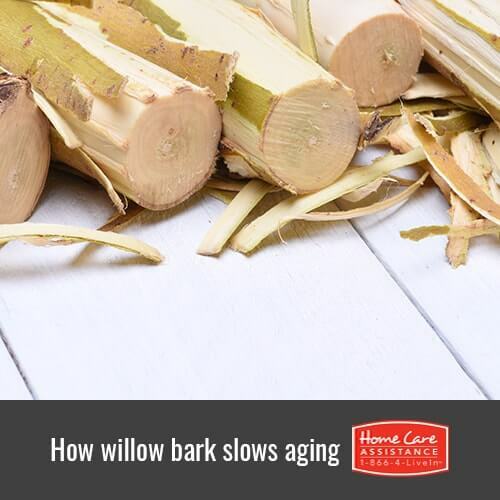 In 400 BC, people were chewing on willow bark to alleviate inflammation, fever and pain. If dating back to the time of Hippocrates isn’t impressive enough, live-in Oshkosh caregivers only need to consider the fact that this powerful herb is still being used to treat inflammatory conditions and other ailments including tendinitis, gout and lower back pain. Valued for its high content of salicin-A, white willow bark closely imitates the effects of aspirin. Additionally, this amazing bark can also work as an anti-aging remedy. Aesthetics are important to people at every age and the golden years are certainly no exception. Willow bark is widely known as an anti-acne treatment, but it can also do wonders for dry, aging skin that has begun to lose elasticity. Daily applications of willow bark extract can significantly smooth away fine lines and wrinkles. It’s filled with tannins, flavonoids, and antioxidants that can restore a healthy, youthful-looking glow. The best way to promote longevity and maintain wellbeing is by reducing inflammation. Willow bark has natural anti-inflammatory properties that are capable of fighting inflammation all throughout the body. It’s also great for alleviating arthritis pain without having to rely on prescription-strength or store-bought pain medications. Best of all, willow bark is not known to induce any negative side effects. Willow bark is also an impressive antiseptic. Pair that with its ability to limit inflammation and it’s the perfect topical application for a wide variety of skin conditions. If seniors have areas in which their clothing has chafed the skin or red, irritated rashes as the result of incontinence or incontinence products, solutions containing willow bark can supply rapid and lasting relief. When applied to a senior’s face, it is gentle enough to reduce redness and irritation to restore skin to a neutral skin tone. There are a number of genes in the skin that have a direct impact on how quickly and severely the skin ages. The expression of these genes changes over time, which is the primary underlying cause of lost skin elasticity, sagging skin, and fine lines and wrinkles. Studies have shown that routine use of willow bark, particularly early on, can decrease the expression of genes that cause aging skin while boosting the expression of genes that keep the skin looking youthful and healthy. A large part of feeling well is looking our best. Willow bark and other natural products can significantly reduce the appearance of aging and consequently boost senior self-esteem and wellbeing. With Home Care Assistance of Oshkosh, WI, we emphasize the importance of senior wellbeing both inside and out. Our experienced caregivers help clients with daily activities including nutritious meal preparation, physical exercise, grooming, and more to boost longevity. Let us help your loved one enjoy the golden years he or she deserves. Call (920) 710-2273 to speak with a friendly Care Manager about scheduling a free consultation today.